When a tooth is severely decayed or cracked, the nerve inside of it becomes susceptible to infection. Filling or crowning these teeth may repair the outside but the bacteria and infected nerve is left trapped inside. The best treatment is to remove the dying nerve and perform a root canal. 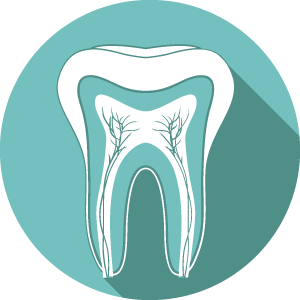 Endodontic therapy is a type of dental treatment that repairs the inside of the tooth, rather than the outer portion. When a nerve has been traumatised or infected, the tooth will ultimately die unless a root canal is performed. Getting a root canal is similar to a filling appointment. The tooth is carefully numbed with local anaesthesia and an opening is created to remove the nerve and any other damaged tooth structures. Next, the hollow chamber is cleaned and sealed off. Finally, a crown is placed over the non-vital tooth to maintain its integrity during everyday use. On some occasions, an antibiotic may be necessary to reduce more severe abscessing before the tooth can be treated. Electing to have endodontic treatment is an effective way to preserve badly damaged or infected teeth. When possible, it’s our priority to salvage and repair your natural teeth instead of removing them. Root canals are just one of the types of general services that we offer at Lightwood Dental to complement our holistic care approach. If you think you have an abscessed tooth or want to find out if a root canal is the best treatment for your toothache, request an appointment today.